This initial posting is to let you know I am who I claim to be and that what Steemit is asking you do is a very good idea. Keeping this short, so I don't floor you with too much information, it all comes down to this. Since I have had issues in the past with what I call "Internet coyotes," I have taken the time to do research with lawyers and cyber security investigators kind enough to share with me the art and science of protecting myself in a cyber kind of way. Well, how does this apply to Steemit, you might ask? 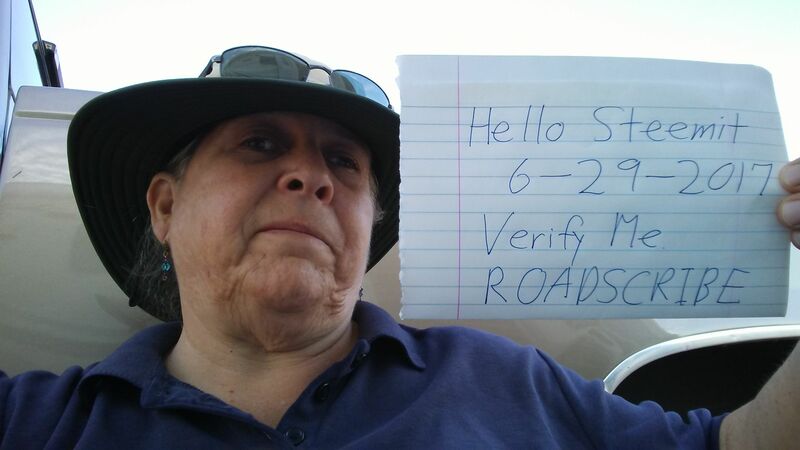 By posting your photo and a simple hand written note, you are knocking on the Steemit community door, saying, "This is who I am and I can prove it." Yes my friend. In the long road of learning the writer's trade I can tell you first hand that fixing an identity theft or even shaking an Internet predator can require a lawyer and private investigator, and it's expensive. But there is light at the end of the tunnel. Learn how to protect yourself and you will be the last man standing, so to speak. Knowledge is power. If you stand defiant we all win. With this said, you will see the sunhat and sunglasses in my photo. In my future postings you will find them placed on a laptop in, who knows where, for my lifestyle is mobile as well as my RV office also known as The Cave. This is my insignia, even if some of my imaginary reporters chime in, giving you a different prospective, in this land of an ever Changing America. Hi there @roadscribe and welcome to Steem. I've been scammed on the Internet but not big time. I've been here awhile and haven't witnessed any scams thus far. Here is a place to start your journey. Start here: https://steemit.com/welcome Scroll down the page you'll find a ton of valuable Steem information. Make sure to participate in this weeks giveaway to get known in the community! @reggaemuffin, the creator of this bot is a witness. See what a witness is and consider voting for the ones you feel are good for steem. Welcome roadscribe... Nice introduction! I'm just a few days old myself and the response has been very good with many kind words. I agree knowledge is power, and learn to protect yourself and ourselves, and this community as a whole will be the last standing... GREETINGS!!! I'm a bot-helper, and I'm created to help. Congratulations on the registration on Steem - you really like it here! If you like me, make an upvote of my comment and follow me. Your upvote will allow you to give more money to new users, such as you. Let's make Steem better together! I follow you, and to get more upvote and resteem - follow me! All the money I earn will be donated to charity. You are my first Follow. I look forward to reading your posts. Welcome to Steemit! Happy RVing! Welcome to the community !! @roadscribe Donna! You made it! Congratulations, and I hope you do well on Steemit. I followed and upvoted you. Looking forward to reading your blog. Good luck. Edit: just a quick add...you're going to get a lot of "please follow me" ...check out their blogs first to see if they're worthwhile. The number of followers you have means little. Some noobs think that's the way to progress on Steemit and it's not. It's quality that counts, not quantity, on Steemit. Thanks for this advice. I've been slow starting out but this too shall pass. And yes, research is a good idea on the sites here. Take care. You're welcome! @roadscribe You'll get there. I've been on here a year and it takes awhile to get used to Steemit, plus the rules keep changing (hopefully for the better). hi Roadscribe! 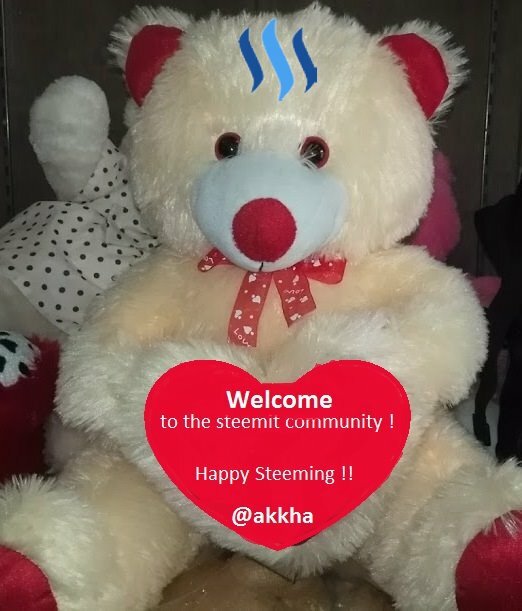 Nice to see more people like you - here joining steemit ! Becoming a steamian is a great adventure!! Here you can win money while bloging! At the beginning it wouldn't be easy, but it isn't impossible. So just write from your heart and everything will be allright. ! Cheers! Greetings, @khunpoom! And from the heart is what all of my work is based on. Sounds better already.